I don’t know how many of you are classical music buffs but, at any rate, I thought I would give this video a try and see if I have – at the very least – a handful of classical appreciation readers on board here in the MCL Community. 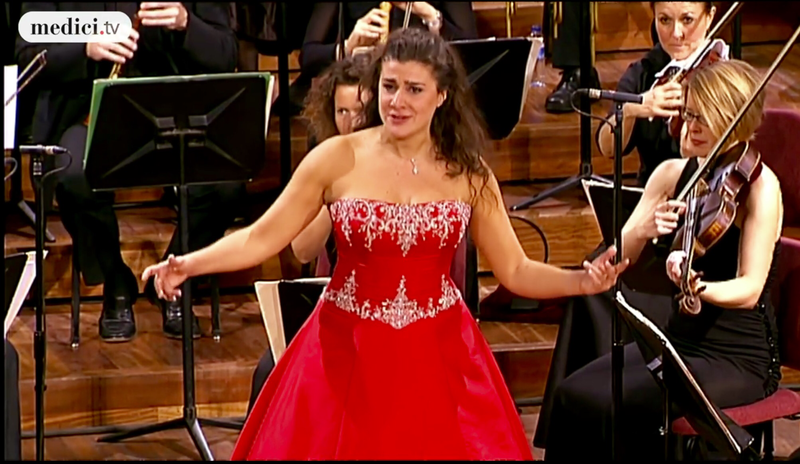 Cecilia Bartoli is my favourite classical singer. Bar none! The physicality she uses when she sings is astounding. She is so attuned to the rhythmic pulse of the music that her entire body becomes an instrument in and of itself. You are advised to be seated when you watch this world famous mezzo-soprano’s performance of the classical aria “Non Piu Mesto” by Rossini. Believe me when I say this will be a transformative 3 minutes in your life. How she can navigate her enormous range while maintaining her composure and style is beyond me. She is a vocal gymnast. There is no other word to describe her ability to use her voice in a way that leaves the listener speechless. If anyone can infuse the rockstar elements into the classical music genre known as Baroque music it would be Cecilia Bartoli. She has a command of the stage that is spectacular and a joy to behold. She embraces her music with passionate enthusiasm and passion. It is absolutely wonderful to behold. Her technique is part Bel Canto, part Cecilia. It certainly is not the norm but it has worked for her in the same manner world-renowned Canadian Pianist, Glenn Gould, adopted his own unique style of playing. These artists are geniuses – pure and simple. Undeniably, however, they have worked incredibly hard to achieve international status and all artists must strive to learn from them and hopefully achieve greatness in their career. I was fortunate to see Cecilia Bartoli in concert in Toronto quite a few years back. And – I also managed to snag some really neat tickets at the last minute. I was a few rows back, seated in the center of the Roy Thomson Hall in Toronto with all the patrons and concert subscribers. It truly was a serendipitous experience for me and my husband. Some times the stars align just right! However, because the air conditioner was detrimental to her vocal cords, we sat in an unseasonably hot concert hall in October. Ah the memories. But, no one complained. We were riveted to the talented bundle of musical joy on that stage. Cooking MasterChef Discussion For MasterChef Season 7: Battle For The White Apron Part 1. That was insane! Thank you so much for posting this. If you hadn’t, I would have missed it. I was extremely lucky one time to have met her! Let me know if you want the sordid details, lol. Glad you enjoyed this classical performance. I was surprised at the positive feedback here and on my Facebook page in particular. Nice to see so many classical fans appreciate such a talent. I think there are a lot of people who like classical music and even more of those who don’t know it, but would’ve liked it if they were exposed to it. If you look at some comments on YT e.g. under Bartoli videos, under video of Netrebko and Garanca’s singing of Flower Duet, under Pavarotti’s videos, under Damrau’s singing of the Queen of the Night aria, under Amazing Coloratura Sopranos of all times video (this one would actually make a great demonstration of bel canto technique here), you’ll see that most comments are from people who aren’t familiar with opera. I’d imagine if you dedicate a post or two to it occasionally, you’ll see positive response. Oh, and lest I forget — Barbara Bonney’s singing of Schubert Ave Maria gets millions views and very positive response on YT. Kitty – thanks so much for the suggestions. I love when readers guide me toward videos or performances which are interesting to the MCL Community. I will definitely add more topics about classical performances in the future. Thank you, Thank You! !